Service company ratings are updated daily on Angie’s List. Companies are graded on an A through F scale in areas ranging from price to professionalism to punctuality. 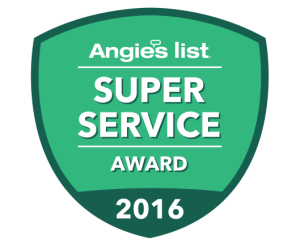 Members can find the 2016 Super Service Certification logo next to company names in search results on AngiesList.com. or for an immediate response call us today at 585.223.3190. Ask us about our payment plans and financing. Call us today at 585.223.3190 for a free estimate!